Time to end the week on a Masters of Cinema release announced by Eureka Entertainment. Out on 28th April is the Billy Wilder classic Ace in the Hole starring Kirk Douglas, and co-written by Lesser Samuels and Walter Newman. This is presented with a brand new 1080p high definition transfer in its original 1.37:1 aspect ratio, a plethora of promised extras that we have no list of yet, plus the obligatory 40 page booklet with a new essay, vintage interview material and rare archival imagery. With a runtime of 111 minutes, the recommended retail price will be £17.99. 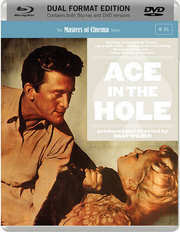 Since re-emerging in the 2000s, Billy Wilder's superb Ace in the Hole, so ahead of its time in the 1950s with its acidic and unflinching examination of journalistic ethics and human morality, has taken its place alongside Double Indemnity, Sunset Boulevard, or Some Like It Hot as among the director's greatest works. In one of the most powerhouse performances in American screen-acting, the great Kirk Douglas stars as Chuck Tatum, a newspaper reporter who stumbles upon a potentially career-making story in Albuquerque, New Mexico (nearly sixty years later, the setting for Vince Gilligan's Breaking Bad). When Tatum begins to influence the story's outcome, a descent beings that finds more than one man caught between a rock and a hard place. An electric narrative that stands as one of Wilder's tautest and most (melo)dramatic plots (penned with Lesser Samuels and Walter Newman), Ace in the Hole plays today as a prescient examination of the modern media landscape, and the public appetite for the disastrous news-story that leads to toxic wish-fulfilment. "I can handle big news and little news. And if there's no news, I'll go out and bite a dog."